« Quick, Easy, and Beautiful! Deal of the Week #3 — Rhinestone Brads! Whoo-hoo! 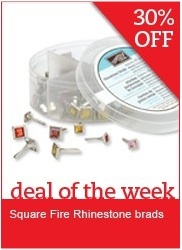 This week’s Stampin’ Up Deal of the Week is Square Fire Rhinestone brads! Normally $10.95, this week only $6.99! Brads are a fun addition to any project, and these Rhinestone brads add extra fun and sparkle. Rhinestone brads coordinate with Stampin’ Up!’s exclusive colors, so there’s no need to guess about what colors to use your brads with. Offer good through July 20, 9:50 AM (MT). Shop now or contact me or to order today!